The government has declared that this month is national preparedness month, a month where anyone without a survival plan should do everything they can to get prepared. Obviously I think that’s a great idea. The simple fact of the matter is in a matter of seconds life can go from completely normal to absolute chaos. If a terrorist went down to your region’s power hub and set off a bomb, millions of people (including yourself) would be without power just like that. Or what happens when the perfect storm converges right on your doorstep and levels your community…? And then there’s always the threat of martial law. Personally I think it’s one of the more likely scenarios given just how divided our society is today. All that being said I want you to take a look at what FEMA recommends in terms of preparation. I’ve taken the following information directly from their website for you to look over. Read it and then tell me what you think about it in the comments below. There’s a lot of information packed inside of this blog post, so if you didn’t get time to read it all that’s OK.
My recommendation for anyone is to start preparing based on the order of importance. The rule of 3 always serves as a great starting point. So that means you’ll want to get supplies that can keep you protected from the possibility of being without any of those items for that amount of time. Air’s a tough one to deal with..but shelter is an easy thing to prepare for. 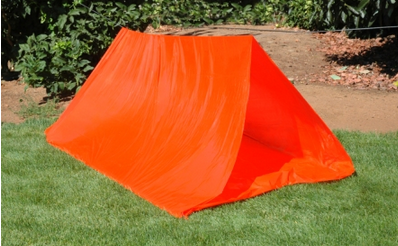 I personally recommend a tube-tent as a low-cost survival tool to keep you safe from the elements. Our tube tents are really affordable, cheaper than a ticket to the movies. To get one click on this link or the pic below. This entry was posted in Emergency Survival, Family Survival and tagged national preparedness month, rule of 3, survival situations on September 10, 2015 by Survival Frog. I DON’T TRUST THE GOVERNMENT………TRUSTING THEM MEANS F.E.M.A. CAMP!!!! Well what about all the wild animals at the Zoo this should be a concern after all if they are on the loose we will be there new source of food. That is one reason everyone should have a gun to protect yourself from criminals, illegal Mexican criminals that the Obama administration let loose on the public and wild animals as well as snakes. Randolph, wild animals will be the least of your problems in the event of a melt down. Your biggest problem will be the two-legged animals that will be let loose from the prisons. No warden is going to leave prisoners to starve to death in their cells if there is a general dissolution of society. They will turn all the prisoners loose to wreak havoc on society. If you are near the county jail or near a state prison, your life will be a living hell for quite a few months until the scum have been killed off or until you have been killed off. Unless you live very close to a zoo, the semi-wild animals will disperse away from man and all the chaos that will be around where people are. Your next biggest problem after two-legged animals will be packs of feral dogs. Dogs do not generally fear man. They are pack animals and packs of wild dogs will not be afraid of man. Most people at the beginning will look at feral dogs with warm feelings until they start to hear of attacks or attacked themselves. Your best bet — shoot all dogs you see and if they look healthy, eat them. I have it on expert opinion (not from first hand experience) that brown dog is tastier than black dog. Biggest problem I see is for people on fixed income. We are on SS and have no other income so we can’t afford to do the things necessary to prepare for these possible scenarios. First–Stop the “we can’t do it” mindset. Of course you can do the things necessary to prepare. Starting with food–Start with the things that are nutrient/protein intense, require only water to prepare, and are easily accessible–examples–brown rice and beans .Begin to eat them at home now and for every pound you buy, store a pound. Simple rice and beans are inexpensive compared to eating out or ready prepared foods. With the money you will save eating this frugally you will be able to buy storage containers–here I suggest unused teflon lined paint cans (from hardware store) and food grade plastic storage bags to line them. Each can will hold about 8 lbs of dry beans/rice. Add to each of the bags with the food 2-3 bay leaves to prevent spoilage/bugs. These are easy to transport and store, so if you have to evacuate anywhere, you have something to bring with you. If you plan to be with friends or family, always bring something with you to help, and paint cans filled with rice and beans will always be welcome. You will find you have some space at the tops of the cans you are filling–can add baggies of hard candy, spices, fastfood restaurant size soysause, ketchup, syrups etc. Get started and Smile! Robert, you do what I do. Nickel and dime it. It might take quite some time to build up any kind of stockpile but by buying two when you can get a prepper type item on sale and only using one while holding the other back for emergencies you can eventually build up at least a small stockpile of emergency supplies. Three examples that come to mind immediately are sugar, tuna, and pinto beans. Around where I live all three occasionally run for very low prices and we will purchase an extra one to put back for emergencies. By doing this we have been able to build a few days worth of supplies. I also apply the principle to other things such as duct tape, fishing supplies, tarps, etc. They leave out probably one of the most damaging of all…..The collapse of the financial infrastructure here and all over the world and I firmly believe the total collapse is closer than anyone had expected and that is what I’m making plans for in all the important ways to protect my family. I doubt that FEMA or any other organization in the government really cares about the folks period…..
Only possible answer as to why would fema do this…It’s just that much more supplies they would have to steal from us when they need it. Sorry, but that’s the reason. We know they could care less about the Americans, ie: obamacare, amnesty by pen, DOJ, IRS etc, etc, etc. It is possible that someone with a conscience talked FEMA into posting this “September Preparedness Month” warning so they could live with themselves! Does it really matter what the reason is? Like Damian says, it could be a warning! Without actually telling us what they know is coming! But being prepared is our responsibility, no matter if it is just for three days or three months! Winter is coming, that is a great reason in my neck of the country!